Build enterprise apps at the speed of low-code. LANSA ’s low-code platform includes an integrated IDE, meta-data repository, rules engine and development language for extending Web, Mobile and Windows applications. 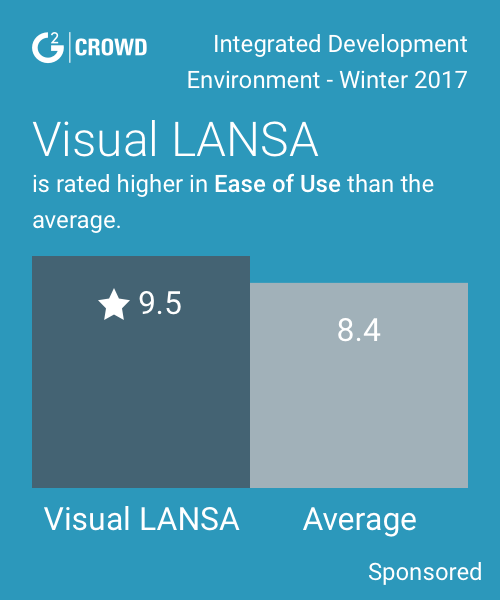 Visual LANSA is a low-code, Integrated Development Environment (IDE) that allows you to build mobile, responsive web or desktop applications (Windows, browser, mobile devices) for cloud (AWS, Azure) or on-premises (Windows, IBM i, Linux). LANSA’s unique single language concept insulates developers from worrying about browser, mobile and server compatibility, allowing them to focus on building applications with the advantage of low-code simplicity when you can and full-code business logic when you need it. LANSA incorporates an integrated meta-data repository and business rules engine to protect data integrity and reduce application development and support effort. LANSA has an application framework which provides the architecture, infrastructure and plumbing code of a pre-built commercial business application. Its zero-code prototyping tool, which includes built-in security, navigation and flexible searching, is a ‘living’ prototype because it evolves into a finished application as real components are snapped into it. The framework provides a desktop-style user experience in the browser that enables users to work on multiple tasks concurrently and switch between them easily and seamlessly. Hi there! Are you looking to implement a solution like Visual LANSA?